Supersonic Acrobatic Rocket Powered Battle Cars . . . hardly a name that rolls off the tongue but it just happens to be one of the most addictive (if overlooked) indie games on the PlayStation 3 to date. With a die hard community of fans who still turn up week after week to play online against each other there was a clear audience of hungry gamers ready for a second helping. No surprise then that the lovely chaps at Psyonix decided to bring out a sequel with perhaps a slightly catchier name, Rocket League. Now I say sequel but to be fair this is more of a reboot if anything as all of things you may have loved from the first game are there but substantially improved for the PlayStation 4 and PC. The most important element has certainly carried over, this game is as fun as hell and will no doubt be on many players rotation for some time. The aim of the game is simple, two teams of cars, one red and one blue and a goal for each. Score more than the other team through a variety of gravity defying football moves with the help of the rocket fuel boost system, sounds simple right? Getting the basics right will take a few goes but it is simple to pick up, mastering the potential moves however will take some time and patience. Experienced players will no doubt be right at home but newbies can only gaze on in awe as pro players gracefully fly through the air to put the ball in the back of the net. Fear not though there are various practice modes which will help mould you into the ultimate player, some of the pro training is incredibly challenging. Obviously being a next generation title the gorgeous graphics stand out, the level of detail, lighting and particle effects are all absolutely gorgeous. Blades of grass weave back and forth, each of these are animated and as discussed on the show it does appear that the beautiful looks do put a strain on the PlayStation 4. A recent patch has gone some way to stabilise performance and whilst my PS4 still sounds like it may take off at any moment some of the online issues do seem to have been rectified. Rocket League is easier to control than SARPBC, the cars have much more precise turning and physics but whilst these aspects have been tweaked and improved on the last game it certainly does retain the same feel. There is a handy new Ball Cam mode which helps to keep the action firmly focused on the ball, this is great for beginners to keep track of where they are in relation to the ball and the opposition goal. It's also very useful to hit triangle when you are racing back to your own goal, so you always know where the ball is, keeping the ball out though is another matter! The audio is much improved this time around with pumping electronic music and some cool stadium sound effects. The crowd counting down to the end of the game adds that little bit of pressure (especially if there is only a goal in it) and helps to generate that real competitive feel. Car customisation is a new feature which gives you a huge variety of different designs and decals with which to pimp out your ride. By simply playing matches you will unlock paint jobs, wheels, aerials and hats (yes, hats!) which when combined in different ways give you hundreds of potential looks to choose from. 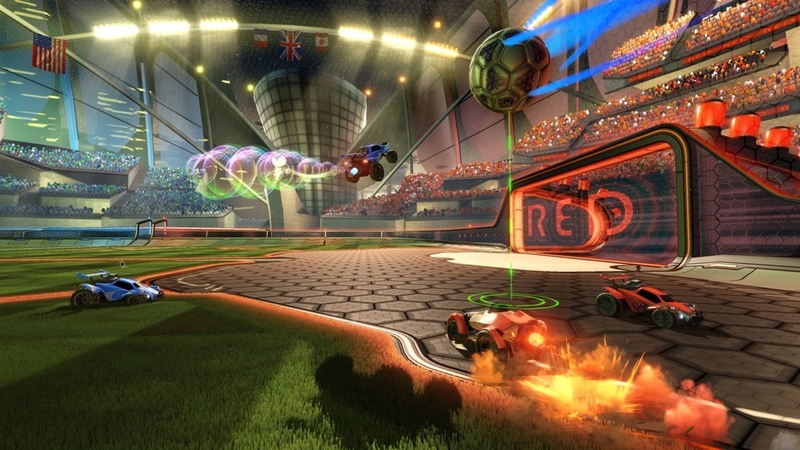 Rocket League is obviously a multiplayer game with online casual and ranked matches from 1 vs 1 up to 4 vs 4, this is where the bulk of your time will be spent but there are a few single player or offline game modes which you can enjoy. The standard offline match will give you enough practice before you venture online and the bots put up a decent enough challenge on the harder difficulties. One new feature is the seasons mode where you can create your own team and go head to head against the computer over a set number of weeks, through the playoffs and eventually lifting the trophy. Rocket League really is a wonderful game, in a time when PlayStation Plus is much maligned with the offerings of free games here is an absolute gem which has taken the PlayStation community by storm. A magic formula of simple mechanics, addictive gameplay and a surprisingly deep and rewarding competitive scene has made this game an instant hit. This is exactly the sort of unique and fresh IP that the gaming community should be supporting, this game gives you a sense of joy that you may not have felt for some time. Yes it looks great and it is very well made but it reminds me of gaming back in the 8/16 bit days when you played games with friends just for fun. The first batch of downloadable content is now available and is very reasonably priced for an extra stadium and a couple of new cars. Let's face it you most likely got this game for free so go and support Psyonix and show them just how much we appreciate what is more than likely the indie hit of the year.